Seattle Manufacturing Corporation's 3.5 ounce Summit snow saw is the easily the lightest full-size snow saw on the market. 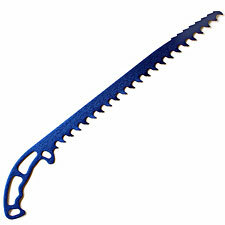 As much as I love ultralight gear, however, I must confess that what sold me on the Summit is its rakishly handsome shape and gleaming blue aircraft-grade 7075 aluminum blade. The Summit—dare I say it?—has the look of a product whose designers were interested in form as well as function. If for some odd reason you decide not to use it, you can always frame it and hang it on your wall. But my guess is you'll end up wanting to use it. In terms of performance, the Summit snow saw is similar to Life Link's slightly heavier snow saw. In contrast to the Life Link, however, SMC designed the Summit to cut on the thrust stroke for improved cutting efficiency. In head-to-head competition, I did prefer the feel of the SMC saw, and I absolutely preferred the lower weight. Note that the SMC ships without a true blade guard. Rather, you get a thin, freezer bag-like sleeve to store and protect the blade (the Life Link comes with a hard rubber guard). This keeps the Summit's effective weight down, but it also means you'll have to be careful storing and packing it to avoid slashing holes in your other gear. Despite the Summit's trim profile, the handle is comfortable provided the snow doesn't get too hard. Here again, the Summit is at least on par with the Life Link saw. Total dimensions are 20.75" x 1.75", making this perfect for both cutting igloo blocks and isolating snow columns for avalanche assessment. The blade is anodized for durability, and to enhance snow release. Good looks aside, I think the SMC Summit snow saw is an easy choice for today's weight-conscious mountaineer, provided you're not looking for your saw to do double-duty cutting wood or ice. If like me you generally hate carrying any extra weight, The SMC Summit gives you all the performance you need at a very modest three and a half ounces (measured). This one's recommended.